For elementary students of two Regent Park schools, today marks the last day of classes, but this year the date means more than the beginning of summer vacation in the neighbourhood. 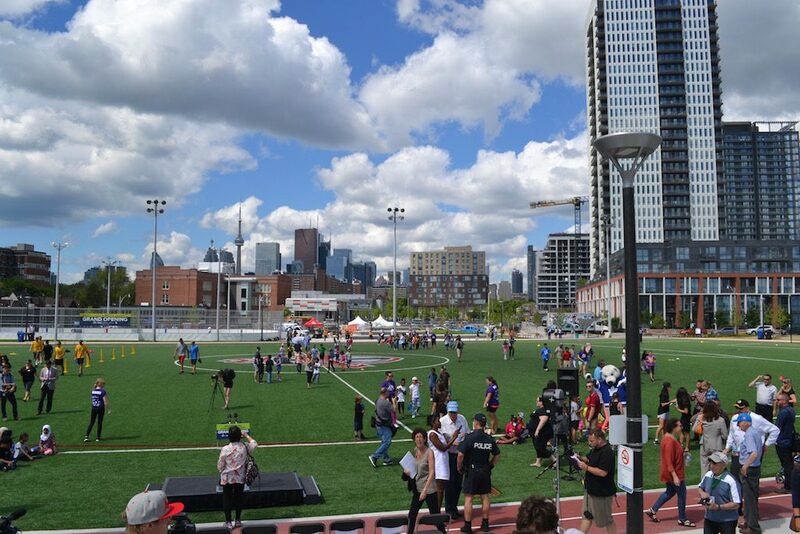 It marks the official opening of the Regent Park Athletic Grounds, a 2.8-acre public sports complex at 480 Shuter Street that students from nearby Lord Dufferin Public School and Nelson Mandela Park Public School now have access to. “It’s a centre for recreation; that’s one of the things that the community lacks,” says Greg Spearn, president and interim CEO of Toronto Community Housing (TCH), standing near a brand new basketball court. Through a public-private partnership, The Daniels Corporation and Toronto Community Housing, the City of Toronto’s public housing corporation, have been revitalizing the 69 acres of Regent Park, one of Canada’s oldest social housing communities, as well as its largest. This sprawling athletic centre is part of the mixed-use project’s third phase. It follows the earlier opening of an aquatic centre and Daniels Spectrum, a gallery and art space, as well as the creation of numerous residential buildings including market-rate condos and affordable rentals, as well as commercial offerings. 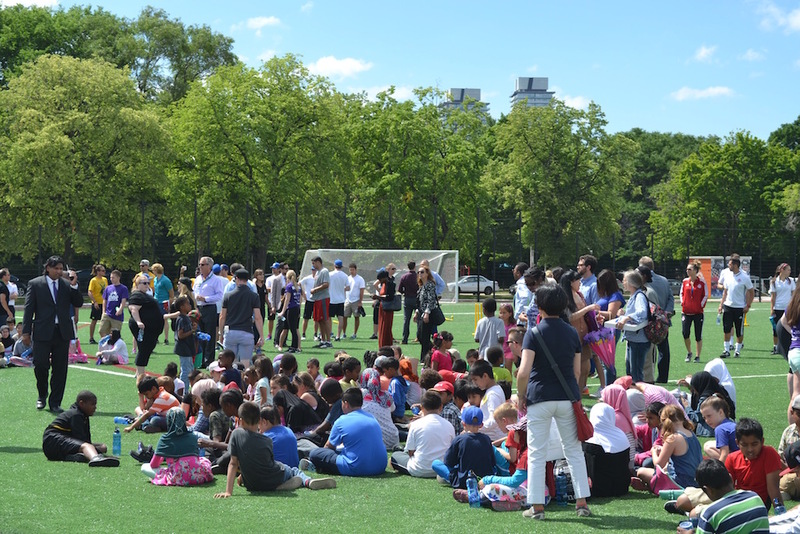 To usher in the official launch this morning, local students played around the basketball court, soccer field, running track, cricket pitch and hockey rink that make up the Regent Park Athletic Grounds. The path to creating the Regent Park Athletic Grounds wasn’t direct, explains Martin Blake, vice president of The Daniels Corporation. “The original plan for Regent Park had a series of parkettes and what we recognized is these parkettes didn’t really lend themselves to kids having fun,” he says, noting community feedback helped guide the planning process. Maple Leaf Sports and Entertainment lent a hand, donating $2 million to go towards construction of the grounds. They’ll also be involved in organizing after school programing like the sports drills that were hosted today while Carlton the Bear, the Leafs mascot, roamed the field. While the Regent Park Athletic Grounds are open for use, work on sites surrounding the it continues. Among these projects, The Daniels Corporation is pushing forward with developments including 13-storey, 189-unit townhouse and condo community The Bartholomew and The Wyatt condos. Children filed off the field around noon, but from 5pm to 8pm this evening a community celebration — including food trucks, autograph sessions with Leafs and Raptors alumni and sports drills for kids — will take place.